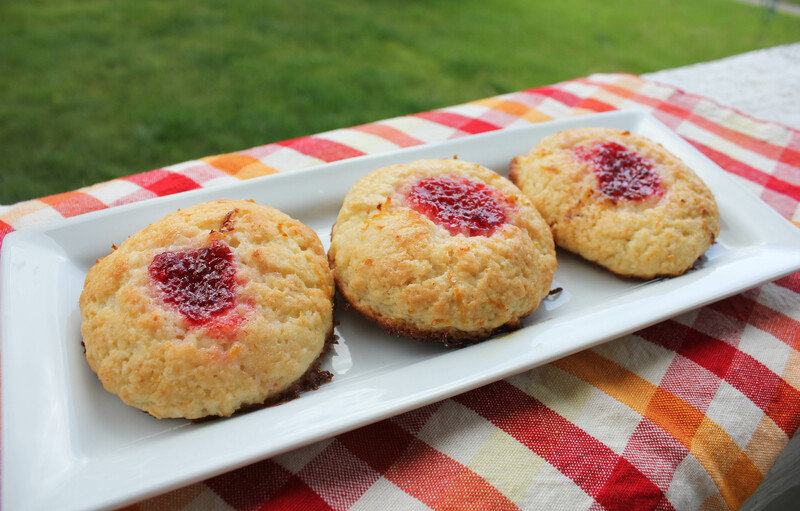 I didn’t plan on doing a third PB&J recipe for the guide, but I got an urge to make scones over the weekend and this recipe popped up. I had everything I needed so I figured, why not? These scones were by no means too dry, either, and I think the peanut butter helped with that. In a large bowl, combine flour, sugar, baking powder, baking soda and salt. Add the butter cubes and mix with your hands until the mixture looks sandy. Mix the peanut butter in with your hands as well. Add the milk and yogurt. The dough should be soft but sticky, and you may need to add more milk as you go if the mixture is too dry. Place the dough on a lightly floured Silpat or sheet of parchment paper and form into an 11-by-9-inch rectangle, about 1/2-inch thick. 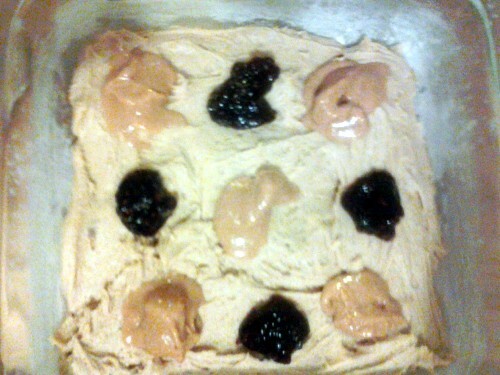 Spread the jam over the dough and sprinkle with the chocolate chips. Fold one long side of the dough toward the center, then fold the opposite side over that to form three layers, in the same way you would fold a business letter. Press lightly on the top of the dough to seal it. Slide the dough, still on the Silpat or parchment paper, directly onto a baking sheet. 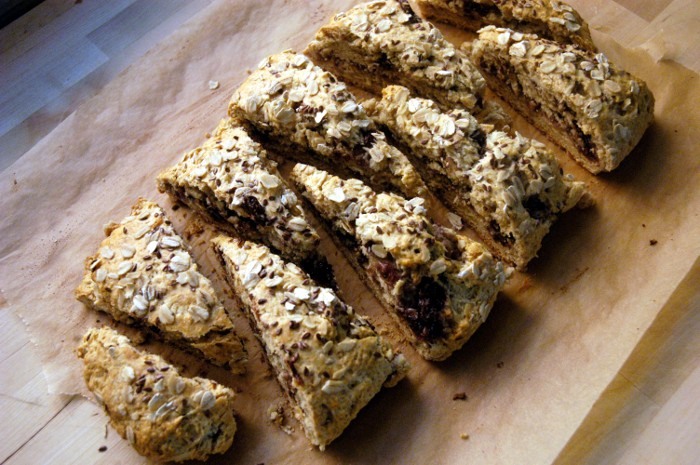 Brush the top of the dough with milk and (if using) sprinkle with oats and flaxseed. Bake at 375 degrees for 30-35 minutes, or until the top is golden. Once the scones have cooled, cut into either squares or triangles. Makes about 8-10 individual scones. Dynamic Duo is our nod to the sandwich staple during the back-to-school season of September. 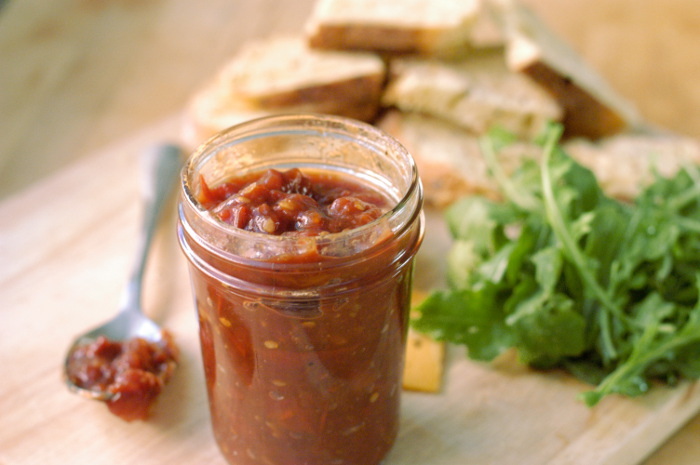 Click here for all of our alternative PB&J uses. 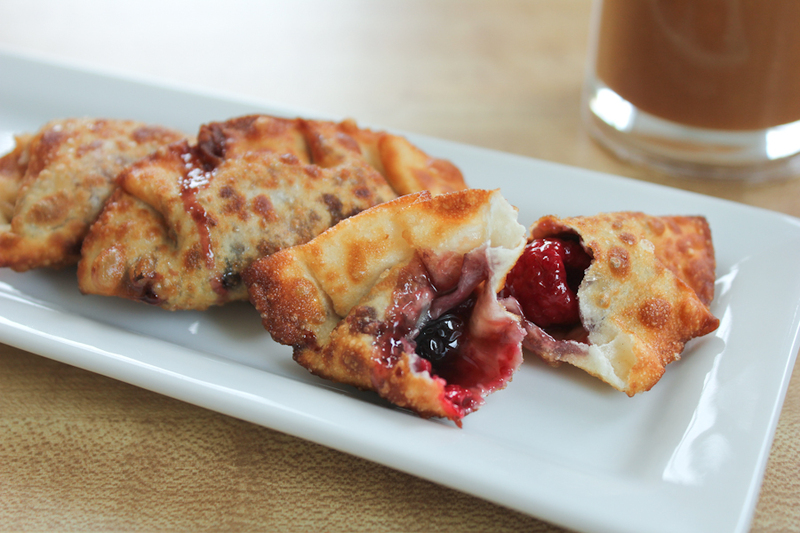 These wontons are super-sweet, so instead of filling them with just jelly, I added a raspberry to each to add natural sweetness. If you have leftover peanut butter sauce, save it and use it on ice cream or waffles! Lay out the wonton wrappers on a clean, dry surface. Add about 1 teaspoon jelly and a raspberry to the center of each wrapper. Wet your fingertip and run it along the edge of each circle. Fold each circle and half and press the edges to seal. Use more water if necessary. Next, create 4 small folds along the edge of each wrapper, and use wet fingertips to reinforce each fold. Set the wontons aside. Pour vegetable oil into a large pan so that it’s about 1/2 inch thick. Place the pan over medium heat and heat the oil until it’s hot, about 5 minutes. In the meantime, prepare a cooling rack by covering it with paper towels. To check whether the oil is hot enough, you can carefully flick a few drops of water at the oil. If they sizzle and pop immediately, the oil’s ready. Add 6 of the wontons to the pan, and allow them to cook until they bubble up and turn-golden brown on the bottoms, no more than 20 seconds. Flip the wontons and cook for no more than 20 seconds longer. Using a pair of metal tongs, transfer the wontons to the cooling racks. Repeat these steps to finish the wontons. To prepare the peanut butter sauce. Heat the water and sugar in a small pan over medium-low heat. When the sugar has dissolved, stir in the peanut butter with a wire whisk until the peanut butter is entirely incorporated and creamy. Serve the sauce in a bowl, or drizzle it over the wontons. Serve immediately. Makes 4 servings, 3 wontons per person. *Dynamic Duo is our nod to the sandwich staple during the back-to-school season of September. 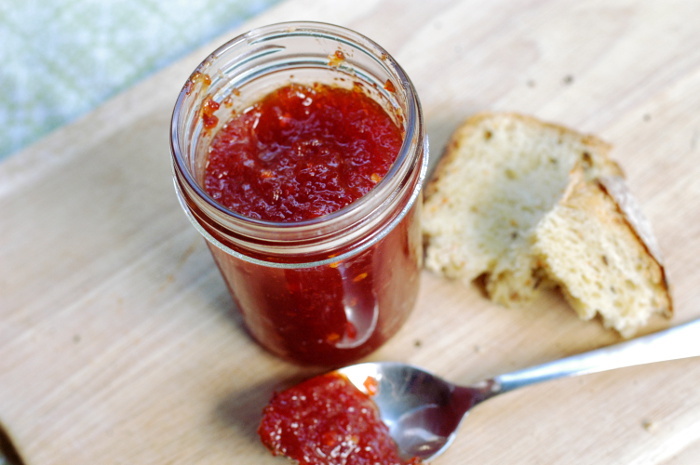 Click here for all of our alternative PB&J uses. 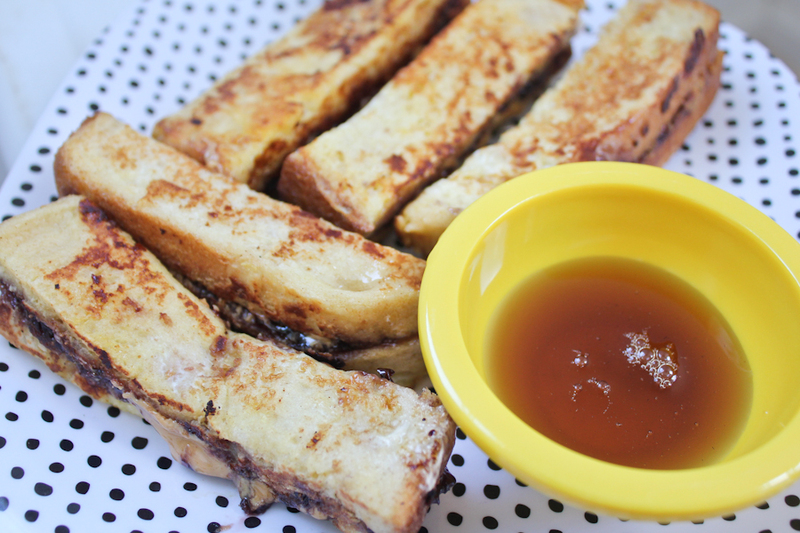 Well in theory, syrup usually goes with French toast, so I figured: Why not? But the truth is, syrup isn’t necessary for this version. With quite a bit of peanut butter and jelly sandwiched inside each stick, the dish was already sweet enough. Spread the peanut butter on two slices of bread. On the other two slices, spread the jelly. 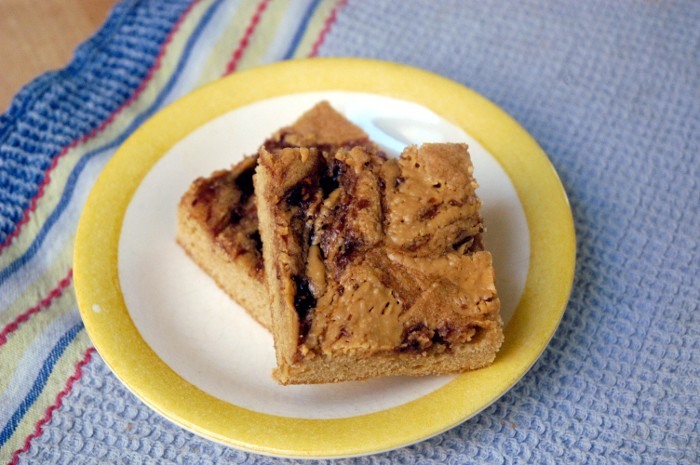 Pair each slice covered in peanut butter with one slice covered in jelly to form sandwiches. With a toothed knife, cut each sandwich into 4 or 5 strips. In a medium bowl, thoroughly whisk together the eggs, milk, vanilla and cinnamon. Put a small pat of a butter in a pan, and place the pan over medium heat. As the butter melts, spread it around the pan. In shifts, immerse all sides of each stick in the egg mixture. Place the sticks in the pan, and cook on all sides until they’re golden brown. Whisk together the flour, salt, baking soda and powder in a medium bowl. Set aside. Using a mixer or your own arm power (this isn’t too tough), mix together in a large bowl the butter, sugar and vanilla. Add the egg and mix until fully combined. Slowly add in the dry ingredients and mix until almost combined, folding the ingredients together with a spatula. Sorry for the poor picture quality! I made these around midnight so I just grabbed a cell phone picture. Lightly grease an 9-by-9-inch or 8-by-8-inch pan with butter and flour. Spread the mixture evenly in the pan. Drop 1/2 tablespoons of peanut butter and 1/2 tablespoons of jam on top of the batter, alternating with three drops in three rows (see picture). 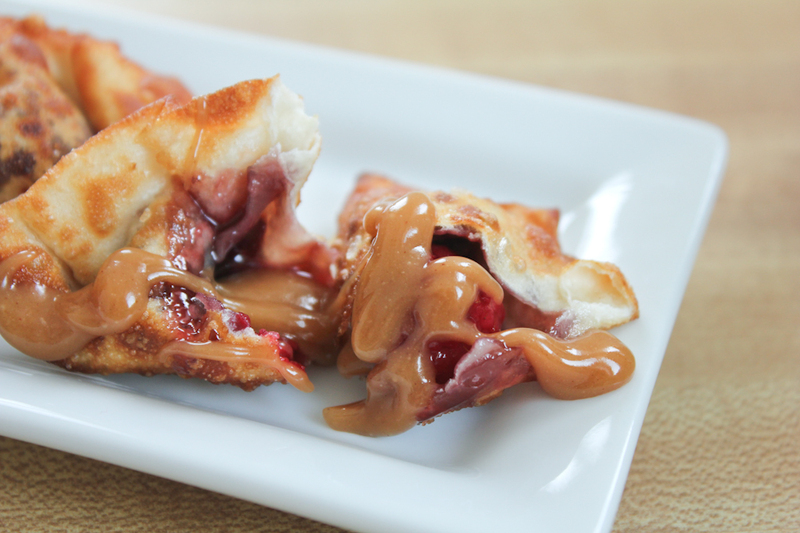 Using a knife, swirl the peanut butter and jelly through the batter. Bake at 350 degrees for 25 minutes, or until the blondies begin to firm up. Allow time to cool before cutting. You can find self-rising flour in the baking aisle of your grocery store. Just read the labels carefully. Position rack in center of oven and preheat to 425 degrees. Line a rimmed baking sheet with parchment paper. Finely grate enough peel from lemons to measure 6 teaspoons; set grated peel aside. Squeeze enough juice from 1 lemon to measure 1 tablespoon (seal remaining lemons in plastic wrap and reserve for another use). Whisk flour and 1/2 cup sugar in medium bowl to blend. Add 1 1/4 cups chilled whipping cream, 1 tablespoon lemon juice, and 4 teaspoons finely grated lemon peel; stir gently to combine. Gather dough together and turn out onto a lightly floured work surface; knead briefly, 4 to 5 turns. Pat or roll out dough to 1-inch-thick round. Using 2 1/2- to 23/4-inch-diameter cookie cutter or biscuit cutter dipped in flour, cut out rounds. Reroll dough scraps and flatten to 1-inch thickness; cut out additional rounds. Transfer scones to prepared rimmed baking sheet, spacing scones about 1 inch apart. Using your thumb, push down the center of each scone to make a deep indentation. Spoon about 1/2 teaspoon of preserves into indentation of each scone. Whisk the remaining 2 tablespoons sugar, 2 tablespoons whipping cream, and 2 teaspoons finely grated lemon peel in small bowl to blend. Brush the top of scones generously with lemon glaze. Bake the scones until they’re golden and a toothpick inserted horizontally into the center of scone comes out clean, 18 to 20 minutes. Transfer the thumbprint scones to rack and cool slightly. Serve scones warm or at room temperature.